Install the PCIe card TBS6984, and then install windows driver and DVBDream from CD. While installing DVBDream, identify installation directory name as “dvbdreamA”, because later you will need to make three other copies of DVBDream folder for using three other tuners of the quad tuner card. Note: To make full use of four tuners of the quad tuner, you need to have four installations of DVBDream and each DVBDream application control a different tuner to lock and tune DVB-S2 signals. But you don’t need to install DVBDream four times, just install once and make three copies. Run DVBDream under “dvbdreamA” folder, Click “Device” on “Options” menu. You can see controlled tuner name on the dialog. Some times, if device not started, you need to choose correct device from the up and down arrow and click “Start” to initialize device. For shifting between different tuner of TBS 6984 card, you can click up or down arrow. To setup satellite and DiSeqc switch, click on “Diseqc” on “Options” menu. If you don’t use any Diseqc, just choose “None”, if you do use Diseqc, choose correct Diseqc type, port and click “Add Satellite”. Choose correct satellite from scrolling down menu, set up LOF and other parameters. 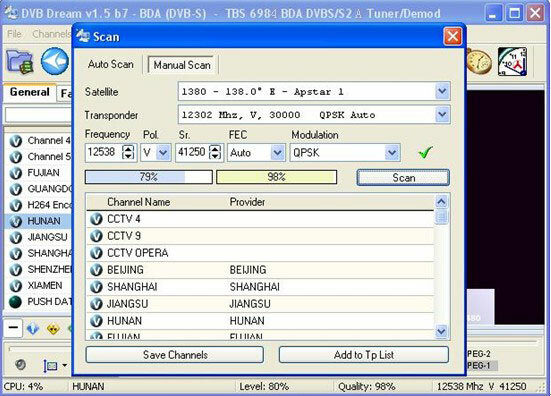 After Diseqc and LNB setting are completed, click “Scan” or “Manual Scan” on “Channels” menu. After scanning, Programs in this Transponder or Satellite will be on the list, click “Save Channels” to save all the channels available. DVBDream allows links to different Video/Audio codecs, to change Video/Audio codec, click “Video” on “Options” menu. 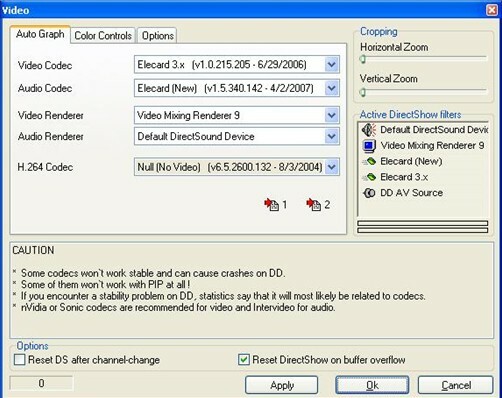 Choose the Video/Audio Codec and Renderer you are in need, then click “Ok” and “Apply”. 1. Close the application, go to folder “dvbdreamA”,and make three copies named in turn dvbdreamB,dvbdreamC,dvbdreamD. 2. Run DVBDream from folder “dvbdreamB”. 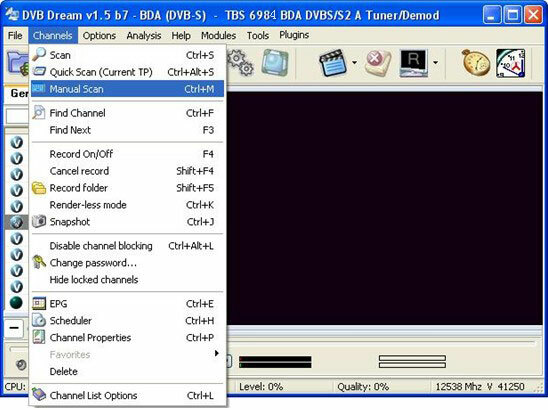 Here let’s get back to the part2, the only different is selecting another tuner device , for example “2” TBS 6984 BDA DVBS/S2 B Tuner/Demod.You can repeat the same for Tuner C and D.
When you have scanned TV channels successfully via the four dvbdream (A, B, C, D), you can watch four different TV channels from four different transponder/satellite at the same time. 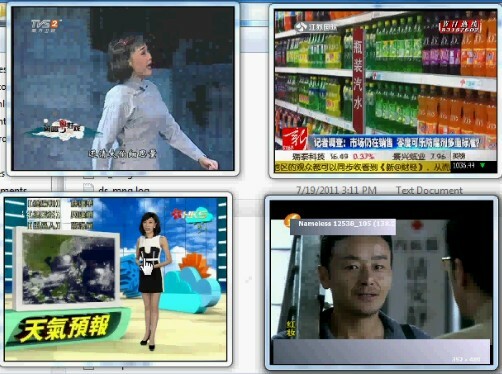 Keep in mind one DVBDream can control one tuner only.